LiDARMILL, the first cloud-based LiDAR post-processing platform, automates your post-processing workflow so you can spend more time meeting your clients' needs and achieving your business goals. LiDARMill can be customized to serve any size organization, from small survey teams to government departments with heavy post-processing requirements. Contact us to build the perfect package. How do I sign up for LiDARMill? LiDARMill is a subscription cloud service for LiDAR post-processing. To subscribe or learn more, fill out this contact form and we’ll help you find the best LiDARMill Tier for your team. Does LiDARMill work with non-Phoenix LiDAR Systems? LiDARMill can process data collected by many third-party systems, depending on configuration. Not sure if your system is compatible? Just get in touch and we’ll help you check. Additional setup may be necessary in some cases, and we’ll let you know how much that may cost. All Phoenix LiDAR systems are automatically compatible with LiDARMill, so no setup or setup fee is necessary. While we’re constantly working to increase compatibility with third-party LiDAR systems, some systems will require extra time for custom configuration. If that’s necessary, our team will let you know how much it might cost based on an estimate of hours at a fixed rate. With the purchase of an annual subscription, the initial setup fee for third-party systems can be partially or fully credited back to you. Please ask your Phoenix LiDAR representative for details. To modify your subscription, you must first cancel the existing subscription and purchase to a new one. Cancellation requires two steps: 1) cancel in LiDARMill by opening the Menu and clicking Payments, and 2) log into PayPal and cancel your subscription from within your PayPal account. Please note that no refunds or proration is possible for subscription cancellations or modifications. Where can I get more details about LiDARMill? To see the detailed terms, see the LiDARMill Terms and Conditions. Once you decide to try LiDARMill, contact us to see which LiDARMill Tier would best support your workflow! How do beta users upgrade? First of all, thank you for being beta testers. We are pleased to offer all beta testers a free month of LiDARMill Pro, which is also known as LiDARMill Tier 2. You can continue using LiDARMill after your free month by purchasing a subscription. Simply open the menu on the left of the platform and click “Payments.” For future reference, please note that no refunds or proration is possible for subscription cancellations or modifications. Do you have sample data I could try in LiDARMill? If you’d like to see how LiDARMill works by uploading and running some sample data, you can download the raw UAV LiDAR files here, and upload them into LiDARMill. Note: As is the case with any UAV LiDAR, do not change the file names, since they contain important data for post-processing. Want a step-by-step overview of LiDARMill? Watch our LiDARMill training video. LiDAR acquisition is only half the job. Our goal is to decrease the time and cost for users to process their raw data into a calibrated point cloud with basic ground/non-ground classification. Meet LiDARMill, the first cloud-based LiDAR post-processing platform that enables surveying teams to take advantage of precision laser mapping without investing in expensive post-processing software and training. 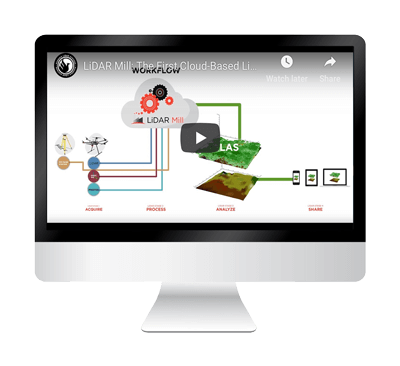 Processing your LiDAR data in the cloud has never been easier. View your data, track project status, and invite clients to view point clouds – all from your LiDARMill dashboard with faster turnaround times and lower overhead costs. LiDARMill can be customized to serve any size organization, from small survey teams to government departments with heavy post-processing requirements. See how LiDARMill’s cloud post-processing platform fits into your workflow to help you deliver data faster, while saving time and money. Post-processing LiDAR data often requires major investments in equipment, training, and software licensing. LiDARMill streamlines the post-processing workflow, automatically generating a ground/non-ground LAS file and gridded DTM. NavLab combines IMU and GNSS data to generate a smoothed and accurate trajectory, a critical step to producing survey-grade data. LiDARMill automatically detects and omits turns and calibration patterns, focusing only on data-collecting flight lines and reducing processing time. LiDARSnap is a powerful feature that minimizes offsets from multiple flight lines, exporting aligned data in the industry-standard LAS format. LiDARMill automatically generates a ground/non-ground LAS and gridded DTM using data processed in previous steps. In Aeromedia UAV, as the best drone specialists with LiDAR technology in Spain, we have been using LiDARMill since the beginning of the beta test days. Phoenix LiDAR understands what surveyors need. They built LiDARMill by asking clients questions about solving a lot of the problems we were having. Processing LiDAR data used to take our engineers so much time. LiDARMill does the heavy lifting in post-processing so we can spend time on the more complex workflows.